One of Wales' oldest and most important books, the 750-year old Black Book of Carmarthen, has become available on the internet. The fragile manuscript has been transposed by staff at the National Library of Wales in Aberystwyth. The Black Book, which was named after the colour of its binding, includes some of the earliest Welsh literature, and includes references to King Arthur and Myrddin (Merlin). The book, which is made of 54 pages made from animal skin, was part of a collection bought for �5,500 by the National Library of Wales in 1904 by its founder Sir John Williams. The verses are thought to be the work of a single scribe working at different periods of his life before and about the year 1250. Lyn Lewis Dafis, the manager of the project, said the age of the book had meant that special precautions had to be taken to prepare it for the internet. "The book is so fragile that a special book cradle had to be used to hold it for photographs to be taken," he said. "It is never opened to an angle of more than 90 degrees. "The work of digitally photographing every page and transposing them onto the web involved the work of six members of specialist staff. "We used a special digital camera and no flash photography was allowed in case the parchment would be damaged." "The manuscript will now be available for people all over the world who don't get the chance to come to Aberystwyth," said Mr Dafis. "It is available for anyone with an interest to have a look at - not just academics." Although it was written in the 13th Century, the Black Book features poems relating to events that had take place centuries earlier. It refers to battles in the Hen Ogledd, or the Old North - northern England and the Scottish Borders, and the mythical drowning of the village of Cantre'r Gwaelod. It is the second of a series planned to be published on the website. 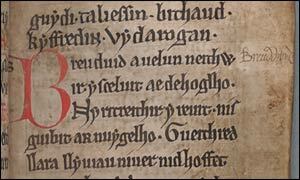 A Latin book on the laws of Hywel Dda was the first to go online. The next project will involve Llyfr Taliesin, written in the 13th Century but featuring writings and poetry from the 8th and 9th Centuries.